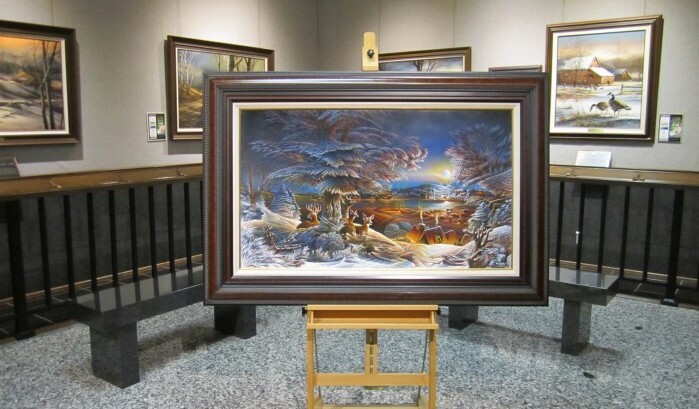 On Friday, August 30, 2019, the Redlin Art Center will place Terry’s final painting in the gallery. For years, the Redlin family held the painting, unsure of how to explain why it is so different from the rest of Terry’s collection. The colors are different. The level of detail is different. The overall style is different. It is a reflection of a very difficult time in Terry Redlin’s life. Terry Redlin was diagnosed with Alzheimer’s disease in 2007 at the age of 70. Shortly after his diagnosis, he announced his retirement. The painting, “Evening on the Ice”, was Terry’s last. He began working on the painting in 2005, but he was struggling. He simply could not finish it. In 2007, Terry’s wife, Helene, and son, Charles, finally convinced him to stop working on the painting and allow it to go to press. After a lifetime as an artist, the disease stripped Terry of his ability to paint - something that was so second nature to him he once said, “To me, painting is like breathing”. Terry Redlin struggled for nine years. He lost his ability to paint. He lost his memories of his loved ones. And, on April 24, 2016, he lost his life. In an effort to raise awareness about Alzheimer’s disease, the Redlin Art Center will display "Evening on the Ice" for the entire month of September. Please join us for this special opportunity to see the painting Terry worked so hard to finish; and help us as we try to raise awareness about Alzheimer’s disease.